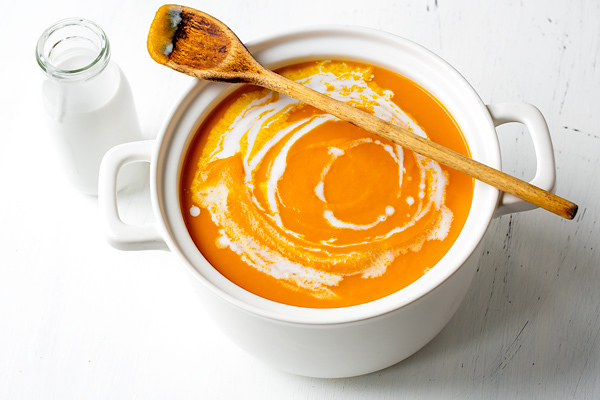 A comforting bowl of this velvety, aromatic, and bright carrot ginger soup is sure to awaken your palate and enliven your spirit! 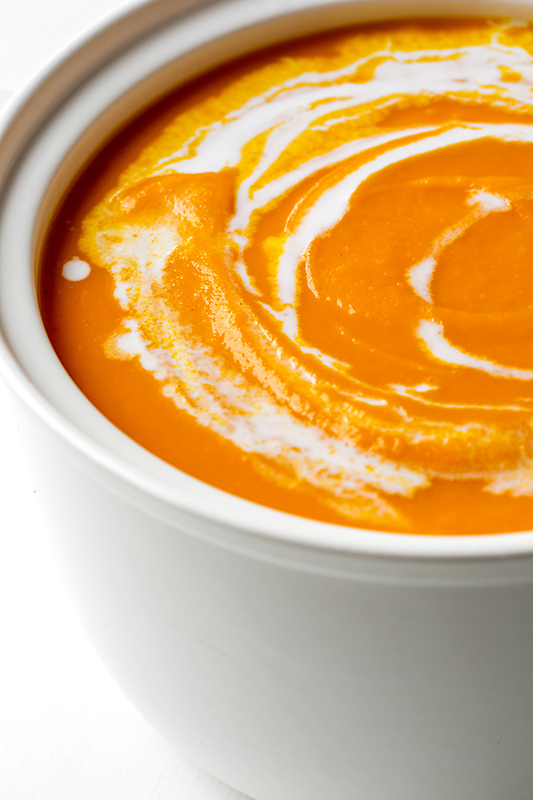 Silky-smooth and wonderfully blended soups are a simple and delicate treat for the palate. 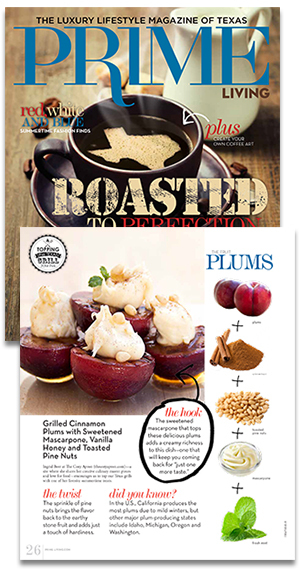 They have an inherent richness and creaminess, and when filled with sweet, aromatic, and colorful seasonal ingredients, they’re a joy and pleasure to partake of with every delicious spoonful. And in these bright and lively months I tend to long for bright, flavorful food that nourishes and invigorates, and awakens and surprises my tastebuds and lifts my spirit. This carrot ginger soup, with its perfect balance of both sweetness and savoriness, and lots of healthy ingredients, is a favorite to prepare; it’s finished with a surprise little twist of something creamy, and blended until luxuriously smooth making it one incredibly soothing soup. While it is a given that both carrots and ginger are a part of the ingredient list for this soup, the extra little pop of sweetness, color, and even texture comes from the sweet potatoes that I like to add. Sweet potatoes offer just a little addition of natural (and beautiful!) thickening power, and help to provide that bit of extra body to this delicious soup. They balance well with the bitter-sweetness of the carrots and the slight spice of the ginger, and help create that deep, orange hue that is so lovely and vibrant! And to give it even more depth, I add creamy coconut milk as a velvety finisher, and just a tiny squeeze of lime for a kiss of brightness. 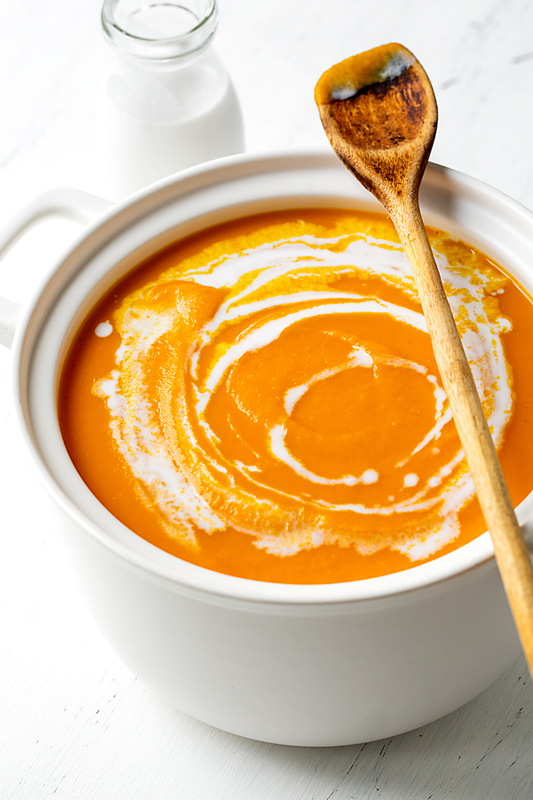 This carrot ginger soup is sweet and delicate, yet wonderfully complex; and it’s the perfect cozy meal to prepare to warm your belly and nourish your spirit! Fresh ginger: While you can certainly use ginger from a jar, freshly grated ginger is so wonderfully fragrant and fresh, and offers a bit of a bite to this soup—delicious! Go completely vegetarian/vegan: I prefer to use chicken stock in this recipe, but it can easily be made completely vegan by using veggie stock or broth. Use an immersion blender for ease: A hand-held immersion blender is perfect to use for this soup; but if you don’t have one, you can certainly use a regular blender. Just be sure to work in batches and to be careful, as hot soup can easily spatter. 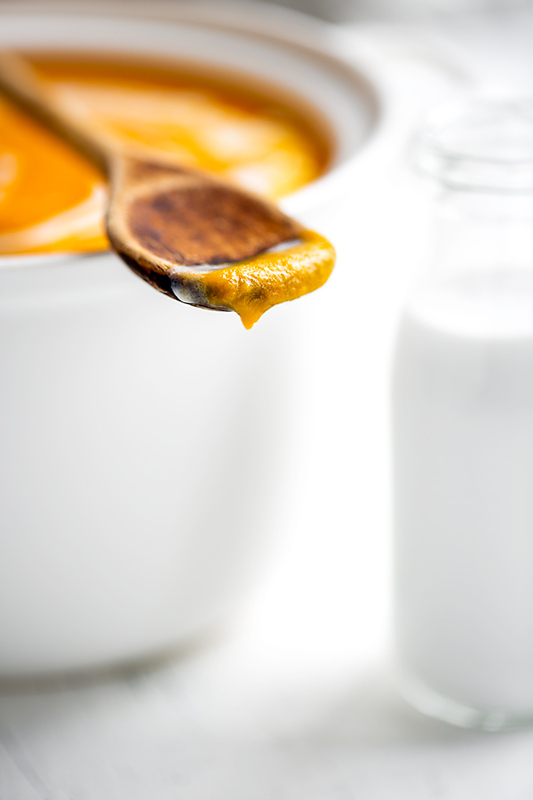 Make it extra creamy: You can substitute coconut cream in place of the coconut milk for extra richness and creaminess. This deliciously fragrant and colorful carrot ginger soup has a touch of coconut milk—it’s velvety rich and so comforting! –In a medium-large pot set over medium-high heat, add the coconut oil; once melted, add the onion and allow to sweat for about 2-3 minutes; then add the garlic and the ginger, and stir until fragrant. –Once fragrant, add the carrots, sweet potatoes, brown sugar, pinch of salt and white pepper, and stir to combine; add the chicken stock, bring to the boil, then reduce the heat and cover, and allow the soup to gently simmer for about 25 minutes, until the sweet potatoes and carrots are tender. –Once the vegetables are tender, remove from heat and add in the coconut milk (save the 2 tablespoons for finishing touch), and puree the soup with an immersion blender until completely smooth and silky (or if using a blender, work in batches using a towel, as soup is hot and may splatter). 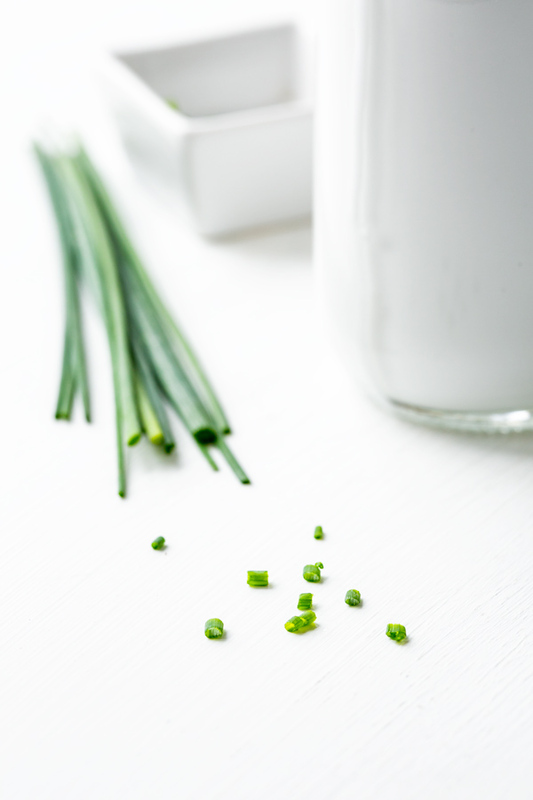 –Once soup is pureed, stir in the little squeeze of lime juice, and check and adjust the salt level, if necessary; ladle into bowls, and garnish with a tiny sprinkle of chives and a small, decorative drizzle of the reserved coconut milk. Hungry for more delicious soup recipes? Check out this Creamy Chicken Chowder, this Summer Corn Soup, or this Chicken Tortilla Soup! Beautiful! And sounds so tasty! wow this Gingered Carrot and Coconut Soup looks purely artistic. I’d not be ale to eat it because it looks so amazing! Thanks for sharing this recipe! What a beautiful presentation of your soup. Every ingredient is my favorite combination for a spring time soup. Love it! Hm adding lime juice and ginger is very refreshing idea ! Nice presentation. I made this tonight for dinner, following the recipe as is (why change perfection). The lime juice is a lovely, bright touch. Delicious! Cyndi, that is great—so glad you enjoyed! 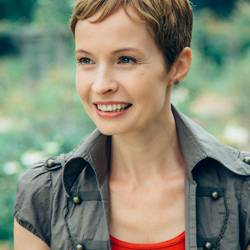 Thank you so much for taking a few moments to come back and share your experience with me. Happy cooking to you!